Seaside living meets Danish modernist in the home of photographers Amy and Joe Keller. Their South Shore, Boston cottage is the perfect balance of vintage and modern style with antiques, souvenirs and mid-20th-century furniture. Tongue-and-grove ceilings, pale wood floors and colorful vintage collections create a nostalgic feel in the Keller's new home. 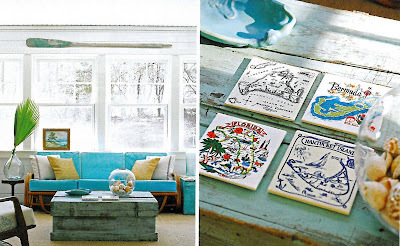 Neutral walls also provide a warm backdrop to the beautiful pops of turquoise blue accents. 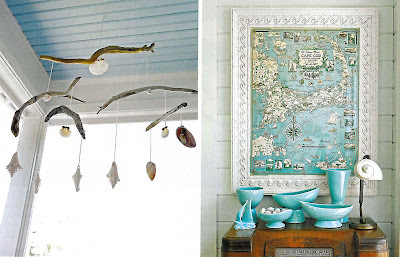 The cottage is topped off with playful accessories like driftwood, pottery and vintage metal globes. To me, this house is absolute perfection and I can only hope my future awesome lakeside retreat will be as equally charming. Stay tuned for a look inside their bedroom and a vintage collection you don't want to miss! I want to be there RIGHT NOW!!! Perfection. I have these pics in Cottage Style still in my magazine "save" pile. I miss that mag so ::sniff::. What a beautiful home! It has such a comfortable, breezy feel to it. love the turquoise amongst all the neutrals! It's so light and airy. I love the map, turquoise pottery and the globes! I LOVE all the globes, Diana! Omigosh this is AMAZING. I have been so mad for turquoise lately. And that starburst mirror over the mantel - to die for! Thanks guys - I feel in love at first sight too! Look at these rooms such a unique and very personal style. Simple and very relaxing I could curl up with a good book in any of these room. I think most people would be happy if their main house looked so good, let alone their cottage. So inviting! What paint color is on the walls?